This example is also printed with the Full Nankin pattern on each side and has a dedicated border incorporating two different vignettes, see Caughley Blue & White Patterns (2012) E23. A coach pot is also known as a bourdaloue after the Jesuit preacher Louis Bourdaloue, whose sermons were of such length that a lady of the court of Louis XIV allegedly had to equip herself with such a receptacle in order to endure his preaching. 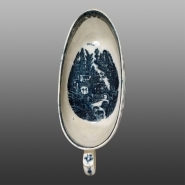 This piece was exhibited in the Caughley 1972 Bicentenary Exhibition No: 101 & Plate 11, and the Caughley 1999 Bicentenary Exhibition No: 301. The other side is printed from the same copper plate. The interior is printed with the Full Nankin from a different copper plate. 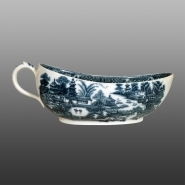 This is a very rare example of a Caughley coach pot or female chamber pot. Such a utilitarian object would have been subject to considerable breakage and would have been readily discarded when no longer used. An entry in the Chamberlain accounts records the purchase from Caughley of "2 coach pots, Full Nankin @ 1/4d 2/8d".